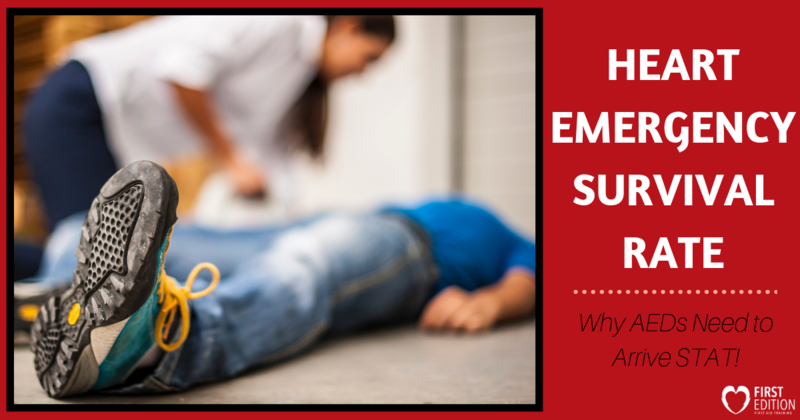 Heart Emergency Survival Rates – Why AEDs Need to Arrive STAT! - First Edition First Aid Training Inc.
Home / Blog / Aed / Heart Emergency Survival Rates – Why AEDs Need to Arrive STAT! Heart Emergency Survival Rates – Why AEDs Need to Arrive STAT! We all know that in emergency situations, we need to react fast. The longer a person does not receive immediate medical attention, the quicker their survival rate will drop. It is for this reason that we get trained in first aid and other lifesaving skills, so we can help right away until 911 responders arrive. This is especially important for heart emergencies and life-threatening incidents, where CPR and the use of an AED are needed. We know that we need to jump into action, but do we actually understand why? 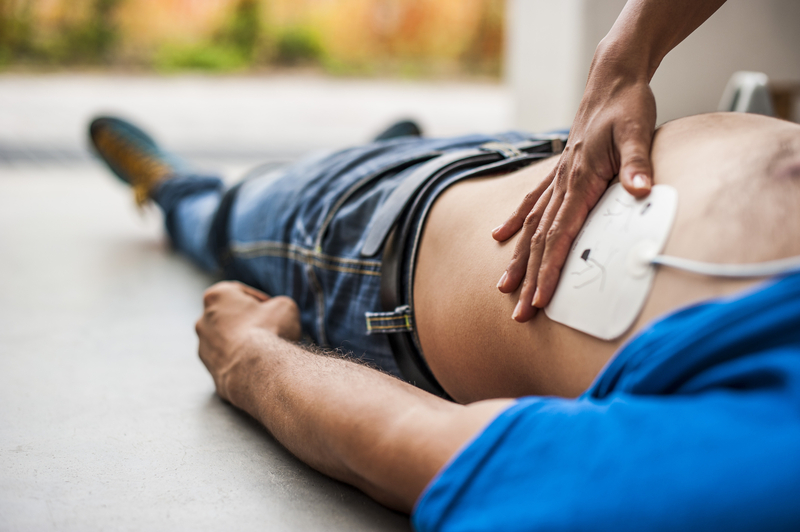 Take a look at why AEDs need to arrive to these heart-related emergencies STAT, and the survival rate of each emergency. Many people will express that they do not feel good when in actuality they are having a heart attack. It is these crucial moments when symptoms are present that 911 should be called and someone should retrieve an AED (just in case). The person may be conscious, able to speak, and able to move around, but it is these next few moments that could be the deciding factor for life or death. On the other hand, the longer you wait to seek medical attention, the more likely this heart emergency will turn deadly. According to VeryWellHealth.com when help is beyond the first “five or six hours the amount of heart muscle that can be saved drops off significantly. 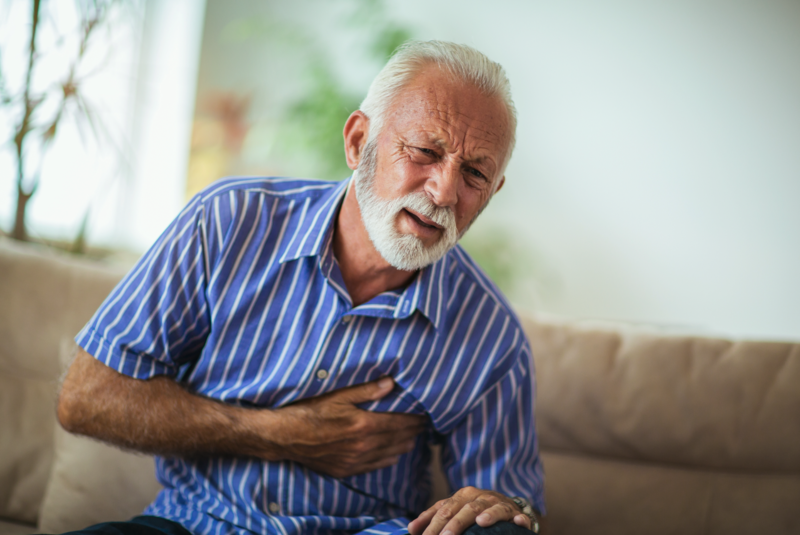 After about 12 hours, the damage is usually irreversible.” Additionally, if a heart attack is not treated quickly, it may even lead to a cardiac arrest which reduces the survival rate drastically. It is when a heart attack becomes a cardiac arrest that you hope the AED has arrived and can be used STAT! As soon as you recognize these symptoms it is detrimental that action be taken right away. Surviving a cardiac arrest has nothing to do with what the patient can do and everything to do with what the first responder can do. According to the Heart and Stroke Foundation, in Canada the survival rate of a cardiac arrest outside of the hospital is 5%. When a person has gone four to six minutes not receiving any oxygen to the brain, permanent brain damage is highly likely. It is in these few minutes that an AED should be already brought to the emergency location, attached to the patient, and shocks be administered to get the heart back into a normal rhythm. The survival rate beyond 8-10 minutes of not receiving proper attention and not getting the heart beating regularly again is rare. As a first responder, you have a responsibility to act as quickly as possible if you want to save the casualty. Immediately call 911, tell someone nearby to bring you an AED, STAT!, and begin CPR compressions and breaths (or compressions only option) to keep blood flowing (and avoid further brain damage) while you wait. CPR should be continued until the AED arrives, medical professionals arrive, or the person becomes conscious once again. One of the biggest mistakes that can be made is giving up too early. Stranger things have happened, and even when a person has been unconscious and not breathing for many minutes, miraculous things have occurred when CPR has continued – keep going! Another common problem in these situations is when the AED is too far away. It is these precious minutes used to retrieve the defibrillator that could be the cause of a death. This delay can only be rectified when AEDs are majorly accessible in every location and easy to attain (do you have one at your home and office?). Take a First Aid course to learn CPR and how to use an AED. Be aware of nearby AED locations among your daily routine. Purchase an AED for your location. Speak to your boss/supervisor/building manager to get an AED. Participate in the #FindAnAED Campaign. Share AED awareness with your family/friends/coworkers/neighbours. Every second is precious when it comes to heart emergency survival rates. The faster we can act and retrieve an AED, the better chances that person has to survive. Know how to help and you could give the ultimate gift this year – the gift of a life!